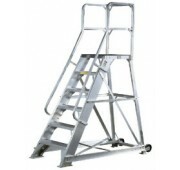 Alco-lite aluminum 30 inch height to platform 500 lb. capacity extra heavy-duty process work stand - Model 730-30. Type 1A. 24 inch x 32 inch base size. Meets and/or exceeds OSHA and ANSI requirements as we interpret them. Large 12 inch x 16 inch platform provides a comfortable work surface on which to stand for extended periods of time. 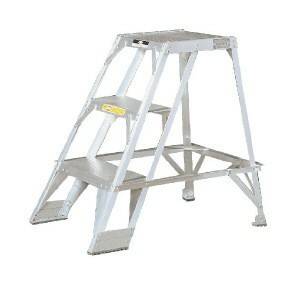 6 inch deep slip-resistant steps for added comfort and safety while climbing and working. Each step is braced front and back with 4 gussets and attached with 16 rivets per step for added strength and durability. 27 degree stair slope for easy climbing. Slip-resistant rubber treads attached to heavy-duty aluminum angle feet provide sure footing. Super heavy-duty aluminum construction- designed and built to last. Optional Tilt-N-Roll casters for easy repositioning and transporting. Optional handrail available.